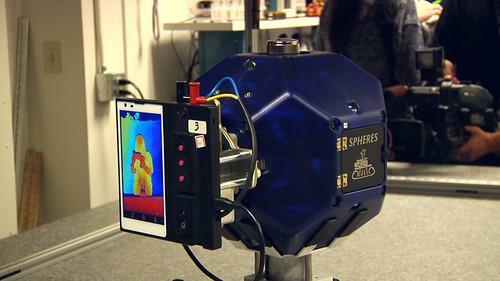 Google's Project Tango, the prototype smartphone packed with sensors so it can learn and sense the world around it, is heading to the International Space Station. Two of the Tango phones are due to be launched to the ISS on the upcoming Orbital 2 mission, which is scheduled to launch in May and take supplies to the station. The phones will be used as part of a NASA project that's developing robots that could one day fly around the inside or outside of the space station, or even be used in NASA's planned mission to land on an asteroid. Work on the robots is already going on at NASA's Ames Research Center in Silicon Valley, and this week the space agency let a small group of reporters visit its lab and see some of the research. The phones, which are being supplied to a limited number of developers at present, were unveiled by Google a month ago. They include several cameras and infrared range-finding so the phone can build up a three-dimensional model of its surroundings -- a significant difference from current handsets that can see only a two-dimensional world through a single camera. Google has already shown the phones being used to build up a detailed map of the interior of a home or office, but NASA has much bigger plans. At Ames, which is just minutes from Google's Mountain View headquarters, researchers have attached a Tango handset to a robot development platform called a "Sphere." "We are researching how effective Project Tango's vision-based navigation capabilities are for performing localization and navigation of a mobile free flyer on ISS," said Andres Martinez, Spheres Manager at NASA. "Specifically, we are researching how well the 3-D modeling and visual odometry can be used to let the [Spheres] free flyer learn its environment and maneuver through it based on what it sees," said Martinez. "This is in contrast to the current Spheres localization system, which relies on fixed sensors in the environment to help the Spheres track its position." Hearing that researchers are working toward a robot that would autonomously fly around the inside and possibly outside of the ISS carrying out checks, Bolden asked if the same technology could be put to use on NASA's planned asteroid mission. The space agency wants to approach and capture a piece of an asteroid, and Bolden wondered if the work could form the base of a robot that could approach, analyze and help identify a target for the mission. Researchers hit upon the idea of using smartphones in their development work when they realized the features they wanted -- Wi-Fi, a camera, more processing power -- were all present in an off-the-shelf device. The phones in use by NASA have had several minor modifications. The lithium-ion battery pack has been removed, the phone is powered by six AA batteries and the cellular radio chip has also been removed to put it into "the ultimate airplane mode," said Provencher. A cover has also been put over the screen to contain pieces of glass should it be shattered.